Freedom Williams was just 8 the first time he performed for an audience, too. He was tapped by his elementary school to portray Frederick Douglass. When Williams read the online version of Creative Loafing's recent feature story on Tony P., he felt a connection to his younger Charlotte protégé whom he’d never even met. 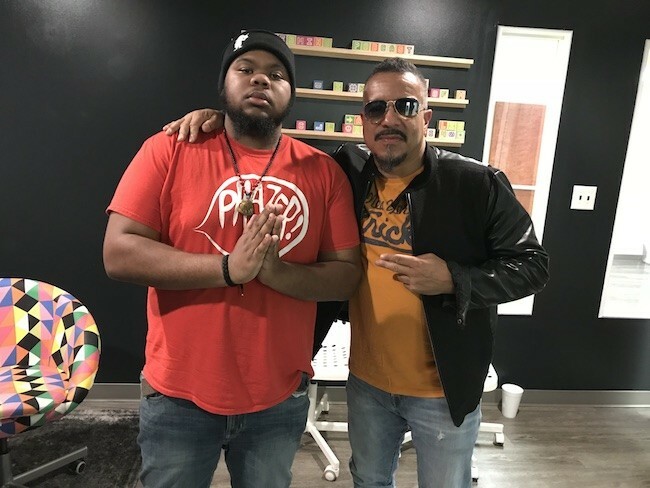 Williams, 52, was so inspired by the story that he contacted Creative Loafing and asked if we could get him together with the 26-year-old rapper who calls himself Phaze Gawd. 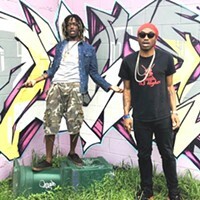 On Wednesday, May 23, the veteran New York rapper flew to Charlotte from his home in Brooklyn to surprise Tony P. on Creative Loafing’s Local Vibes podcast. It was part of a joint audio and video presentation with Th3 Higher rapper Tizzy Farragami’s Yo! CLT Raps and videographer Barry Espy's Espy Productions. Generational rap summit: Tony P. (aka Phaze Gawd) meets legendary C+C Music Factory rapper Freedom Williams. You can watch the documentary of this special meeting in the Espy-produced video at top and listen to us surprise Tony P. on the Local Vibes/Yo! CLT Raps podcast below. “When I read [Tony P.'s] story, I was like, that’s real — from Frederick Douglass to Freedom Williams to Phaze Gawd. I saw it as transitionary… a musical connection," Williams tells us in the podcast. "Where do you get inspiration from? How do you get inspired? How do we define inspiration? Williams, who’s been touring the oldies rap circuit with fellow veteran acts including Salt-N-Pepa, Naughty By Nature and Tone Loc, came to Charlotte to meet Tony P. in between performances in Iceland and Denmark. Williams’ hits with C+C Music Factory include “Gonna Make You Sweat,” which shot to No. 1 in 1991, followed by “Here We Go (Let's Rock & Roll),” which peaked at No. 3, and "Things That Make You Go Hmmm," which reached No. 4. This June he’ll release an updated version of his first hit as “Sweat25” and is currently working on an EP, #SweatCollectives. Creative Loafing had told Tony P. that we were doing a routine joint Local Vibes/Yo! CLT Raps podcast and wanted him to come talk about his new Phaze Gawd album, Dark Dreams. At the beginning of the podcast, we discuss the album with him, but at the 5:45 mark, we ask if he remembers the lyrics to “Gonna Make You Sweat.” (We knew he did.) As he begins rapping, Freedom Williams walks into the studio and begins rapping along with Tony P., who turns around to see his childhood influence standing right behind him. In the episode, Tony P. and Freedom Williams go on to talk about the individual early performances that charted the course for each of their lives, in different places at different times in hip-hop history. And the two bond over the connecting power of music. As the two generations of rap talk about their earliest performances, my podcast partner Ryan Pitkin, Yo! 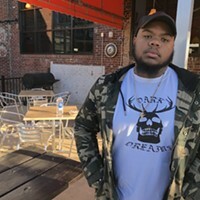 CLT Raps' Tizzy Farragami and videographer Barry Espy are just honored to be present for such a moving meeting of two great musical minds — one of them a rising rapper from the Queen City who calls himself Phaze Gawd.